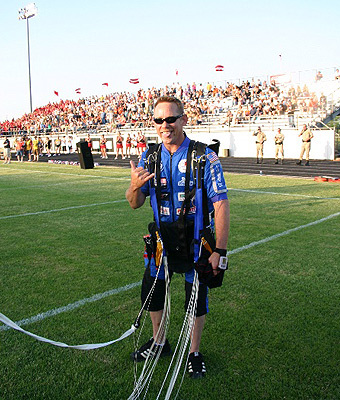 Local Oklahoma Skydiver Earns Awards! Jack Miller is one of our professional cameramen and instructors. He has been skydiving at Oklahoma Skydiving Center since 2001, and he has been awarded his 4000 jump wings and his 48 hours of freefall badge! We are proud of all of our skydivers here, but this is quite an accomplishment and less than 1000 people in the WORLD have ever jumped as many times as Jack! Why did you want to start skydiving? Peer pressure for friends, it took almost 6 months of talking before a friend talked me into it. What is your favorite type of skydive? Outside professional video of accelerated freefall students. Jack also has over 650 base jumps! 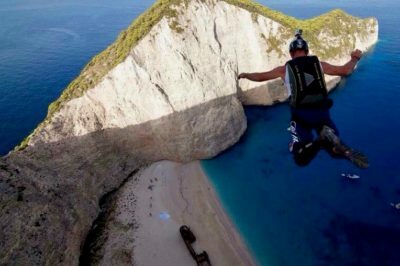 Jack is a true adrenaline junkie, and has jumped all over the world from Switzerland to Greece! The picture below if from ship wreck cove on an island in Greece during the Go Fast Games! What Advice you would give a new jumper on how to get into skydiving!! Go slow, know your limits. This is a sport where you need to put in the time and have patience and keep at it and you can do it! Do your homework, and be dedicated. Skydivers are normal people with an amazing set of skills. 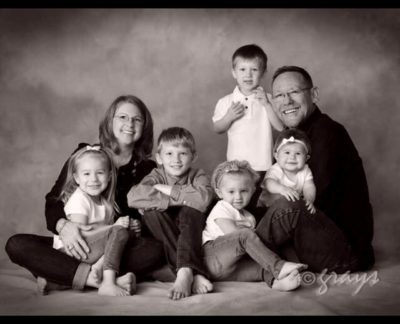 Below is a picture of Jack with his wife Michelle and their grand kids. Jack is a husband of 34 years, father of 2, and has 5 grand kids. Ready to Fly? Learn More about Tandem Skydiving at OSC! How Many Jumps Before Solo Skydiving? 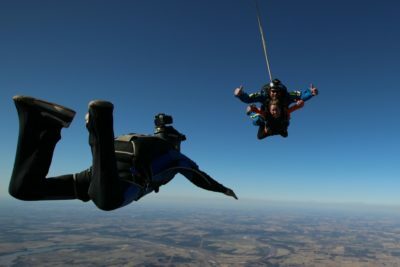 What is the best month for skydiving? Copyright © 2019, Oklahoma Skydiving Center, All Rights Reserved.